Do you love building beautiful things? A career as either a Stone or Brick Mason may be your calling. Stone and brick masons work with building materials to create aesthetically beautiful structures. They use combinations of brick, stone, and mortar to construct walls, patios, walkways, and other important residential and commercial constructions. Being a stone & brick mason is physically demanding, to say the least. Are you willing to enter a physically taxing job? Do you have a keen attention to detail? Can you work long hours to meet construction deadlines? Did you answer yes to any/all of those questions? If so, lets start building that foundation together and help you achieve your Masonry dream with this Land Your Life exclusive career guide. Most stone & brick masons need a high school diploma, or its equivalent, in order to perform the job. According to the U.S. Bureau of Labor Statistics, courses in English, mathematics, and mechanical drawing do come in handy. Stone & brick masonry requires experienced workers to do the job. Aspiring stone & brick masons will need to complete an apprenticeship with an experienced mason, before they’re considered capable of doing the job. Most masons complete a free 3 to 4 year apprenticeship to learn the trade. Unions and contractor associations usually sponsor them. Aspiring masons looking for apprenticeship opportunities should contact their local unions that represent masons. The International Union of Bricklayers and Allied Craftworkers provides a list of such local unions and their training programs. In order to qualify for these 3-4 year apprenticeships, applicants must be 18 years of age, have a high school diploma or its equivalent, and be physically able to perform the demanding job. Apprenticeships teach aspiring masons how to read blue prints, perform the mathematics needed in masonry, and adhere to safety regulations. Within each year of the apprenticeship, aspiring masons must complete 144 hours of instruction and 2,000 hours of paid on-the-job training. Once stone & brick masons complete their apprenticeships, they are considered fit to perform the job on their own. While some masons directly enter apprenticeships, others start out as construction helpers and work their way up. Construction helpers assist stone & brick masons by preparing construction sites, carrying materials, and performing other supportive roles. Masons are classified by the materials they use, so a brick & stone mason is a mason who primarily works with these two building materials. Stone & brick masons have one of the most physically demanding jobs out there. Among their many responsibilities, they must lift heavy building materials, shape sturdy blocks, and construct key buildings. They also mix mortar or grout to spread on the brick and stone layers in order to safely build sturdy structures. Stone & brick masons require math skills to read blueprints and calculate the materials needed for structures. Since they have to meet safety regulations, they must accurately level each structure, using a plump bob, to ensure their creation is perfectly vertical and horizontal. According to the U.S. Bureau of Labor Statistics (BLS), most stone and brick masons work in residential construction, although the need for nonresidential work is growing. This is due, in part, to constructing more buildings using a combination of brick, block and stone. What Does an Average Day for a Stone & Brick Mason Look Like? Stone & brick masons will often start the day working with blueprints. They use these drawings to see what materials they’ll need and to calculate how much of the materials they’ll use for the construction project. Stone & brick masons have to cut their materials, using powerful equipment and hand tools, in order to mold them into appropriate shapes. Using a plump bob and level, they then set the vertical and horizontal alignments of their structures. If specified in the drawings, they’ll also lay out patterns and foundations in the stone and brick. This is all done in preparation for setting the building blocks. Once the stone and brick have been prepped, stone & brick masons mix mortar or grout. They then pore the mortar or grout over the slabs of stone and brick, spreading it evenly between the layers. They do so, in order to set the building blocks to build walls, chimneys, and any other structures detailed in the blueprint. Once done, stone & brick masons fill in any holes between the building blocks, clean excess buildup, and smooth out the mortar or grout for a beautiful finish. Using hand and power tools, stone & brick masons smooth and polish their finished structures. This adds to the aesthetic qualities of their finished product. While building structures is their primary objective, stone & brick masons also do a lot of repair work. Using a blowtorch and other power tools, they remove defective building materials and repair cracked, chipped, and withered brick and stone. These repairs ensure the structures meet safety guidelines and regulations. 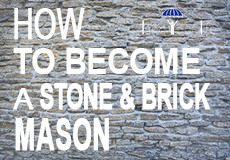 Are You Suited for A Stone & Brick Mason Career? Stone & brick masons have a combination of important qualities that make them fit for the career. Masons must be strong enough to lift heavy brick and stone, some weighing 40 lbs., and operate heavy machinery. Their stamina allows them to work long hours while setting stone and brick without getting too tired. In addition to their fitness level, stone & brick masons must have great math skills to excel at their job. On a daily basis, they’ll need to read blueprints, make accurate measurements, and understand volume and proportions. Stone & brick masons also require great hand-eye coordination in order to evenly apply mortar or grout and ensure everything is meticulously leveled. Like artists, stone & brick masons need to be creative and must be able to visualize the end product of their work. Their visualization skills ensure the structures, they bring to life, are beautiful and stable. Their creativity allows them to effortlessly create designs, patterns, and foundations that make their product aesthetically pleasing. Most masons undergo apprenticeships to qualify for a job as a stone & brick mason. While not required, they can also choose to complete a 1-year technical school program in basic masonry. Masons can choose to complete the program independently, in conjunction with an apprenticeship, before an employer hires them, or as part of an on-the-job training program. Regardless of when they complete it, aspiring masons earn an associate’s degree in masonry through the program. Stone & brick masons also have to be proficient in using an array of tools. From heavy drilling tools to tiny pointing blades, stone & brick masons require training in order to master each tool belonging to their trade. How Does A Stone & Brick Mason Find Work? Stone & brick masons can gain employment through networking. While completing their apprenticeships, they can build important relationships with their supervisors, in order to learn of any new job openings. Generic job hunting sites also list several available jobs for stone & brick masons. One of the best ways to find work as a stone & brick mason is to join unions and professional affiliations. This is another great networking opportunity to meet contractors looking to hire masons. Additionally, unions and professional affiliations also provide job databases or placement programs. For instance, the International Union of Bricklayers & Allied Craftworkers offers its members a job network, where they can connect with local employers, who are looking to hire masons. The Mason Contractors Association of America has a career center site, where job seekers can find employers looking to hiring masonry professionals. What is the Average Salary of a Stone & Brick Mason? In 2017, the U.S. Bureau of Labor Statistics (BLS) reported separate salaries for brick and block masons, and for stone masons. Brick masons and block masons earn an average of $53,390 per year, while stone masons earn $42,370 per year. The top 10% in the brick and block masonry field make about $82,810 per year, while the bottom 10% make $30,550 per year. The top 10% in the stone masonry field make about $63,600 per year, while the bottom 10% take home $24,090 per year. Brick and block masons in Washington, New York, Illinois, Hawaii, and New Jersey can rest easy knowing their states are among the top five paying states for the occupation. As for stone masons, their top five paying states also include Illinois, Pennsylvania, New Jersey, District of Columbia, and Nevada rounding out the list. There are a few ways to increase one’s chances of reaching the higher end of the salary range. One primary tip is to undergo the 3-4 year apprenticeship programs as they give masons a good job history and experience level, which opens the door for better job opportunities. Another great tip is to seek employment within industries that pay more for masonry jobs. For instance, the BLS reports that brick and block masons in cement and concrete product manufacturing, building finishing contractors, local government, nonresidential building construction, and alumina and aluminum production earn the highest annual mean wages. Stone masons should target similar industries. The U.S. Bureau of Labor Statistics reports that the employment of stone & brick masons is expected to grow 12% from 2016 to 2026, faster than the average for other occupations. This growth can be attributed to several factors. Since there’s population growth, stone & brick masons will be needed to construct homes, schools, hospitals, and other important institutions to meet people’s demands. Where there is construction, there will also need to be repairs to fix damages, caused by natural disasters or the normal wear and tear of properties. Additionally, the current masonry workforce is growing older, which means there is a large number of masons who will retire within the next decade, creating new job openings. They offer services to complete the foundation, frame, and overall structure of buildings. They offer building and repair services, alterations, and maintenance options for clients. Experienced stone & brick masons are suited for this position, especially candidates who have the creativity to bring their clients’ needs to life. Communication skills are preferred as well. Work on nonresidential construction projects such as museums, skyscrapers, shopping malls, to name a few. Masons work with construction deadlines and often work long hours to meet those deadlines. This work includes all of the usual masonry responsibilities, including preparing building materials, using mortar or grout, and layering each brick and stone slab to meet the blueprint specifications. Construction workers with experience are suited for the position. Like non-residential work, residential building construction requires all of the usual stone & brick masonry responsibilities. Residents prefer to hire experienced masons to attend to their home’s needs. Annual mean wages can differ greatly depending on the resident’s budget and the type of work required. They work to finish buildings and other constructions. Stone & brick masons in these jobs typically provide additions, alterations, and repairs to structures that need to be finished. Experienced stone & brick masons are perfect for the job, especially masons who have creativity and visualization skills to help bring their clients’ projects to life. They perform specific activities in stone & brick masonry. For instance, masons may provide services like pouring concrete, plumbing, site preparation, and other specialty trade work. Like other jobs, masons offer building, repairing, or maintenance services depending on the needs of their clients. Experienced stone & brick masons are suited for the position, especially if they have years of experience in their specialty trade.